Are you thinking about using do it yourself divorce forms or an online divorce service to save on the cost of your divorce? This is a viable option if you and your spouse are able to work through all the issues of your divorce and can reach a mutual agreement on everything. Doing your own divorce generally keeps the divorce process fairly simple and reduces some of the animosity that spouses feel towards each other. Uncontested divorces are also less time-consuming and costly than other types of divorce. But you need to realize that a do it yourself divorce is not always the best option when dissolving a marriage. There is no history of domestic violence, abuse, or intimidation in your marriage. If you're considering doing your own divorce, you need to realize that it will involve a lot more of your personal time and concentration than if you hire a lawyer to do it for you. You will be the one who files all the papers and works with the court personnel. Before you proceed, it's best to find out how your local court system views self-represented or pro se cases. If it seems like it there are too many roadblocks in representing yourself, you may be better off hiring a lawyer to review and file your paperwork for you. Divorce Petition or Complaint for Divorce - this document initiates the divorce process and outlines what is being requested in the divorce. Child Support Affidavit - If there are minor children of the marriage, this document provides information for the court to calculate child support. Court Summons - This form notifies your spouse that the divorce petition has been filed and sets a time limit to file a response. These papers will need to be served on your spouse. Answer or Cross-complaint - This is the document your spouse files either agreeing to the terms of the divorce or requesting changes. Scheduling Order - This outlines the time-line for your case and may include deadlines for filing requested documents, case management conferences, parenting class requirements, and the date for the judge to hear your case. Financial Affidavits - You and your spouse will both need to fill out financial disclosure papers. Divorce Settlement Agreement - Determines the conditions of the divorce. Divorce Decree or Judgment - The judge signs this document to finalize your divorce. Be sure to ask for a photocopy and request a certified copy from the court. After you get all the forms, take your time filling them out carefully. If you hit snags or if becomes too complex, you can always pay an hourly fee to a lawyer to look over your documents and offer suggestions on how to proceed. You might also consider using the services of 3StepDivorce.com. 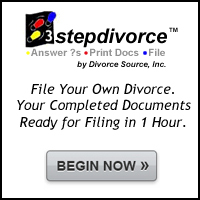 This site helps you complete your paperwork for an uncontested divorce by taking you through various questions which will customize the papers to your unique situation. Your final paperwork will meet your state's specifications and you will get complete instructions for filing your divorce petition and related documents. If your local court system is hostile to do it yourself divorce, you have the option of having an attorney file the papers for you. Since you have already done all the leg-work, this should greatly reduce the fees charged.